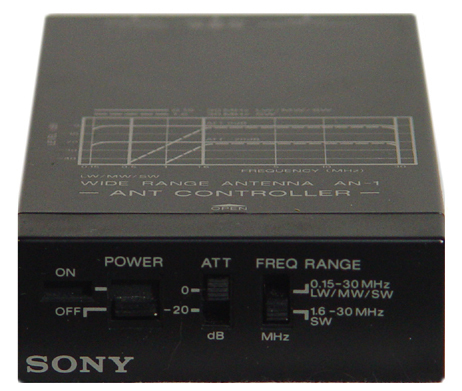 The Sony AN-1 active antenna provides good reception over the range 150 kHz to 30 MHz (longwave, medium wave and shortwave). 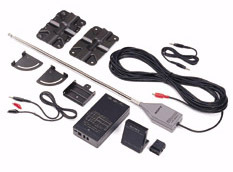 The outdoor antenna amplifier module with 59 inch (1.5 meter) telescopic whip can be connected anywhere outdoors or even inside a window or attic. 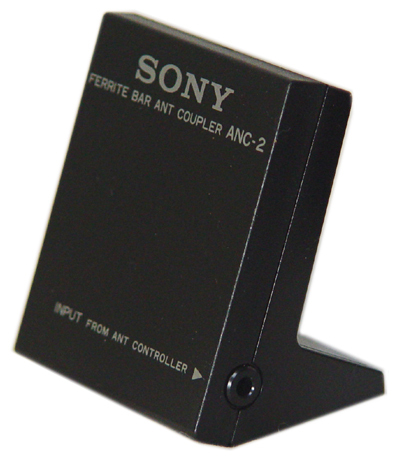 The Sony AN-1 includes 39 foot (12 meters) coaxial feed-line which connects to the compact control box. Output from the control box is a mini jack. Two output cables are supplied: one to alligator plugs and one to a mini plug. The AN-1 can even be used to enhance long wave or medium reception on radios that do not have an external jack. Just place the supplied ANC2 antenna module behind your portable radio to inductively transfer the radio signal into your radio's built-in antenna. The AN-1 requires six AA cells or an optional AC adapter (Grundig 400ACA). The image on the left shows the various pieces and the image on the right shows the item as boxed. The Sony AN-1 has been discontinued.